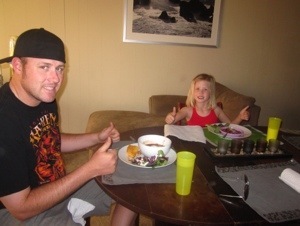 Chili has become a new obsession in my house that my daughter and husband request weekly. I love it because it’s easy and I always have the ingredients on hand. I call it Tuesday Chili because it’s fast and easy enough for a weekday dinner, but because of my little tricks it tastes like it has been simmering all day. My daughter (who never suffers in silence when she doesn’t care for a dish) says I should make this chili for restaurants! This recipe is fantastic when you are running out of fresh stuff in the fridge. I’m not a fan of canned veggies in general – they just seem so gross to me. But beans (and tomatoes) I go for. They don’t seem to be altered as much as other vegetables. Of course, if you want to re-hydrate some dried beans or use fresh tomatoes PLEASE do! It’ll be delish! This chili is very healthy and is even better leftover. You can feed an army on just this amount, but it easily doubles or even triples. And come on, I mean who ever complains when chili is on the menu? The beans are a great source of nutrition and the turkey gives it a hearty, meaty flavor for those of use with relatives who are all about meat & potatoes. I have some amazing tips on spices and how to use them coming your way in this one. Pay attention because you may find yourself using these tricks all the time like I do. Real quick, let’s talk about the honey butter. This is the same thing you will see in some restaurants. In fact, flavored butter is a great fake-out that makes you look like a superstar. It is probably one of the easiest, simplest ways to brighten up a meal or just bread. I flavor my butter all the time with herbs, lemon zest, honey, the possibilities are infinite! Enough talk, time to cook. Now this is really a preference issue. I use ground turkey just because it is a little lighter and a lot healthier. Keep reading to learn how I make it taste better! But if you want to use ground beef, pork or chicken, by all means do! Organic turkey is preferable for many reasons (better taste, often more humane treatment of animals and workers, etc.) and can be found at an affordable price at Costco. Keep onions as a staple in your house, they can flavor so many things! For this dish I am using a plain old white onion but use whatever you prefer or have on hand – yellow, red (purple), etc. White, yellow or Spanish onions are great basic ones that go with anything. Red (or purple) onions are a tad sweeter but have more bite raw. If you hate chopping onions or want them finely minced you can peel, cut into chunks and pulse a few times in a blender or food processor until minced. The beans are also just a preference. I use kidney beans because that’s what I think of when I think of chili. But many beans would work well, even white beans, which would be a tad creamier! I add the black beans because my husband loves them. Use any combination you like or just one kind. It’s totally up to you. Don’t let having different beans stop you from trying this – you just might make the greatest chili of all time! Another great staple to keep on hand with infinite uses. You can also use 2 (15oz.) cans of tomatoes. They can be diced, crushed, etc. If you have whole, peeled ones I just stick some scissors in the can and do a rough cut. If you want more pureed, give them a whirl in the blender or food processor. I love the sweet & smoky taste of paprika (which by the way is just ground up pimentos). It’s a perfect chili spice. Instant coffee is gross to drink but great for savory & sweet dishes. You won’t actually taste the coffee in the chili. It just adds robust background flavor and richness. You can use regular instant coffee or espresso. This is where the heat comes in. Add as much or as little as you like. If you haven’t used Cayenne, try a little and then add more if you need to. Adding bay leaves (fresh or dried) to soups, stews, or chilis rounds out their flavor. I love bay leaves. A great kitchen-witch use for them is to steep them in hot chamomile tea (3 per cup) for someone with a tummy ache – it never fails! PLEASE TELL ME YOU HAVE TOSSED THE TABLE SALT?! In my usual fashion, the spice amounts are guesstimates. I rarely measure, but this is a pretty accurate ballpark. Add as much or as little as you like. Since I have a six-year-old at my table, I keep the heat at a minimum in the pot, but since my husband and I like spicy, we add it in the chili toppings. If I have one on hand, I thinly slice fresh jalapeño pepper and put it on top of ours. If you have all heat-lovers at your table, then add them in the pot. Or add a can of chilies (mild or spicy.) If you forgot the chilies and want spice, just kick up the Cayenne pepper and you’ll be fine. Now I am the first to say processed foods are terrible. If you are buying organic boxed or bottled meals or meal accoutrements you are likely eating less healthily than someone who doesn’t buy organic but cooks fresh. Well, baked goods can be the exception, if you know how to evaluate them. They should only include the ingredients you don’t want to measure out – flour, baking powder, etc. It goes back again to buying quality. Look at the package – if the list is ACTUAL ingredients and not chemicals, you are probably OK. Marie Calendars cornbread mix is the one I use because I know and can pronounce the ingredients. They have tossed a couple long words in there, but my research has shown they are just vitamins. If you don’t want to do the mix, by all means make your own or buy it from a quality store or bakery. Unsalted. Always unsalted. This butter must be room temperature. You won’t be able to mix in the honey if it’s not. I leave it out in the bowl (covered) on the counter all day just so I am sure it will be ready. You can also sub agave nectar if you choose. See? We’re using one of the spices we put in the chili but for a sweet purpose. Cinnamon is awesome! A small pinch of kosher salt will bring out the flavors of your sweet dishes without adding salty flavor. Sweets need seasoning too! Follow box directions, don’t forget to preheat, and then put the batter in the oven to bake around the time you add the beans to the chili to have it all done at the same time. As with everything in life, timing is everything! You can easily shave minutes off your cook time by taking a few seconds beforehand to organize your game plan. You can also add things to your cornbread batter to change its flavor. Cinnamon & sugar or honey to make it sweeter. Or you could skip the honey butter and add jalapeños and cheddar cheese into the batter – YUM! Really, whatever sounds good to you – TRY IT! In a large pot drizzle in the oil and raise heat to medium/medium high. Then sprinkle all the spices, coffee and bay leaves (all except the salt) into the oil. Putting your spices in the oil while it heats does two amazing things: #1 It wakes up the spices, letting them know it is time to release those essential oils where the most flavor is. You might find you can get away using less of a spice if you do this. #2 You are INFUSING the oil you are cooking with. You know that $20 garlic or Meyer lemon olive oil you bought? This is all they did – heat that oil with whatever the flavor theme was. This is the oil the onions and turkey are cooking in, so you will be infusing them and anything that oil touches with a straight shot of spices. It is really the heat doing all of this – the oil is optional. The direct heat is toasting the spices. Kind of like how nuts are much more flavorful toasted. You can do this with ANY dish that has seasoning; dry toast the spices in a small skillet first, then add them. As the oil warms, chop the onion into a medium dice and add to the pot. Also add in the ground turkey. Sprinkle heavily with kosher salt and break up turkey into smaller bits with a wooden spoon or spatula. Let that cook until the turkey is browned and the onions are translucent – about 10 minutes. We’re not trying to add color to the onions, but don’t worry if you do – it won’t hurt anything. We’re “sweating” them to release flavor and take that raw bite out. While the turkey & onions are cooking, open the cans of beans. Drain and rinse thoroughly. Although sometimes I use the canning liquid in other recipes, with beans it can be quite bitter and have a funky taste, so rinsing all the beans in a strainer is key. Add the beans to the pot when the meat and onions are cooked through and give it a good stir. Add the entire can of tomatoes and its liquids. I like my chili with a smidge of liquid in it, so I actually add about ½ a cup water. You can adjust the amount based on how thick you want yours. Remember that it’s going to simmer for a bit. I leave mine partially covered during this part. This allows some of the evaporation to escape and some to drip back into the chili. If you want to keep all of your liquid, cover the pot, and don’t if you want it to be thicker. Don’t add lots of water if you don’t want it thin; it won’t reduce down the way a boiling sauce would. Bring the pot to a boil on high, stirring occasionally. Reduce the heat to medium/medium low and cover. Stir once in awhile. Let cook until the cornbread is done. While the chili is doing its thang and the cornbread is baking, grab a small mixing bowl. Add the stick of butter, honey, and cinnamon. Add a small pinch of kosher salt. With a spatula or a whisk, mix thoroughly until all ingredients are completely mixed. Oh em gee – this butter is SO delish! All you are doing is adding a flavor theme. You’ll still have that unmistakable butter taste, but with the sweetness of floral honey and the warmth of the cinnamon. That small pinch of kosher salt will bring it all together. 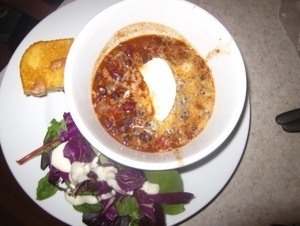 Serve the butter with the cornbread and add your favorite toppings to the chili. Enjoy! And of course, feel free to add toppings!! We all have our faves for topping chili with. Some fresh parsley, scallions or cilantro would add a huge burst of freshness on top of this dish. Use what you like, just make sure it’s quality. A healthy sub for sour cream is nonfat plain Greek yogurt. As far as cheeses, I am of the school that believes in buying the real thing (full-fat) and using less. First of all, if you use real high-quality cheese you won’t need as much because the flavor is better. Also the ingredients used are better. For example did you know REAL cheddar cheese isn’t orange? That is actually an added unnecessary ingredient! Fresh cheddar is white. Although Whole Foods’ and Nugget’s selections of cheeses are unmatched, Trader Joe’s is where I like to buy mine (and Costco too, sometimes). Trader Joe’s has very high quality cheeses and extremely reasonable prices. You can sometimes save several dollars on one hunk or package there. This meal is a great make-ahead. With my daughter’s new involvement in sports, we have softball games a couple of evenings a week. I LOVE when I make this for dinner the night before a game, because chili is always better the next day, and with this recipe we have enough for two nights worth. Then I don’t have to rush to have dinner on the table at a decent hour. I just reheat, serve and wait for the applause! I love to make things that I can get two nights worth of dinner out of. Because lets face it – no matter how much we love to cook, there will always be those nights where a break is needed. And by making this recipe I can save the money I would have spent buying dinner on the way home (that would probably be much less healthy or tasty.) And this recipe is a cheap one to begin with! Much love & light to you all! See you next week! Here’s my recipe for this week featured on Eating For Our Futures, an amazing blog by my friend Adria. Check it out – you won’t be disappointed! PS – New BradyMunch post coming up this week!